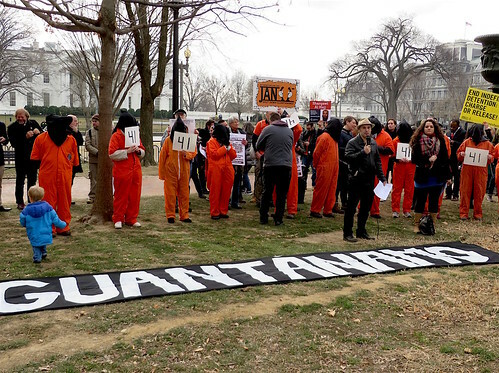 On January 11, 2018, for the eighth year running, I joined protestors in Washington, D.C., calling on the US government to close the prison at Guantánamo Bay, a shameful example of indefinite detention without charge or trial run by a country that claims to respect the rule of law, on the 16th anniversary of its opening. This was the first anniversary that Guantánamo has been under the control of Donald Trump, and there was a passion and an anger at the gathering, replacing the disappointment that was the hallmark of most of the Obama years. I posted my thoughts about the day in a previous article, Telling Donald Trump to Close Guantánamo: My Report on an Inspiring 24 Hours of Protest and Resistance in Washington, D.C. on the 16th Anniversary of the Prison’s Opening, so this update is really more of an opportunity for you to see what went on in front of the White House — the placards and banners, some of the wonderful people involved, and, sadly, the heavy-handed police presence when five protestors tried to carry a banner towards the White House calling for the release of the 41 men still held “along with the thousands imprisoned in immigration detention centers and the millions of victims of hyper-incarceration in the US”, as one of the five, Brian Terrell, described it in an article afterwards. The increased police presence was indeed a sign of a less tolerant presidency, something we have seen for the last 12 months as Donald Trump, flexing his Islamophobia and racism at Guantánamo by refusing to contemplate releasing anyone, even though five of the men still held were approved for release by high-level government review processes under President Obama, shamefully extends that racism to the whole country, via increased deportation dragnets, and internationally via repeated iterations of his vile and groundlessly racist travel ban. For many years now, Guantánamo campaigners have been seeking to bring together different groups of campaigners — those opposing the US’s industrial-scale domestic prison system, for example, with its racist bias and its epidemic of solitary confinement, and, in recent years, the Black Lives Matter movement. Sadly, the need for opposition is not going to go away anytime soon, with Trump at the head of a dangerously right-wing Republican government, but all we can hope for, in an effort to stay positive, is that new alliances can be forged, all of which continue to lead us to a hoped-for place — where there are enough of us to properly realize that we outnumber those who mean us harm, through their wars, their guns, their deportations, their courts and their prisons, whether on the mainland or on a naval base in Cuba. I hope you enjoy the photos, and will share them if you do. Please also consider joining the new photo campaign I’ve launched via Close Guantánamo, counting how many days Guantánamo has been open, and urging Donald Trump to close it without further delay. Andy Worthington is a freelance investigative journalist, activist, author, photographer, film-maker and singer-songwriter (the lead singer and main songwriter for the London-based band The Four Fathers, whose music is available via Bandcamp). He is the co-founder of the Close Guantánamo campaign (and the Donald Trump No! Please Close Guantánamo initiative, launched in January 2017), the co-director of We Stand With Shaker, which called for the release from Guantánamo of Shaker Aamer, the last British resident in the prison (finally freed on October 30, 2015), and the author of The Guantánamo Files: The Stories of the 774 Detainees in America’s Illegal Prison (published by Pluto Press, distributed by the University of Chicago Press in the US, and available from Amazon, including a Kindle edition — click on the following for the US and the UK) and of two other books: Stonehenge: Celebration and Subversion and The Battle of the Beanfield. He is also the co-director (with Polly Nash) of the documentary film, “Outside the Law: Stories from Guantánamo” (available on DVD here — or here for the US). Here’s my latest article, promoting the photo set I took at the annual protest against the continued existence of Guantanamo, outside the White House, on Jan. 11, which, this year, was the 16th anniversary of the prison’s opening, and the first anniversary in which it is open with Donald Trump as president. I reflect on the ongoing struggle to close Guantanamo, and also on the larger struggle against a racist president and administration, and, as I state, I hope that “new alliances can be forged, all of which continue to lead us to a hoped-for place — where there are enough of us to properly realize that we outnumber those who mean us harm, through their wars, their guns, their deportations, their courts and their prisons, whether on the mainland or on a naval base in Cuba.” I hope you have time to look at the photos, and will share them if you like them. Included are photos of five activists arrested in a heavy-handed police operation. Posting links to this and other parts of your work in high visibility places. Thanks, Tom. I always appreciate any assistance in getting the word out. As you know, this is a world with a full-time multifaceted diversion machine trying to make people ignore what’s really going on. Just curious. In your work and travels here to the States, have you ever been hassled by immigration, DHS, MI5 or someone else? Maybe MI5 still maintains files on people they suspect of having “subversive tendencies” (whatever that means). Funnily enough no, Tom – although as a lawyer friend of mine drily observes about the US, “We have freedom of speech, but only so long as you’re not annoying the powers-that-be too much.” I’m evidently only a minor irritant.